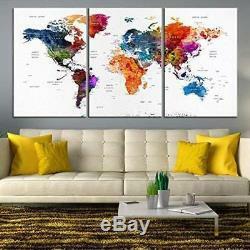 Track your travels with this beautiful large sized colorful canvas map of the world. Have a big empty wall space to fill? 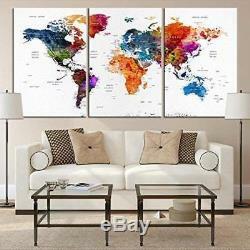 Nothing has more impact than our colorful antique world map. When friends and guests walk into your room its brilliant color palette and rich canvas texture will knock them off their feet. 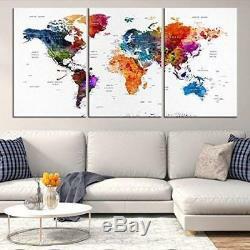 Perfect for living rooms, bedrooms, childrens rooms, and offices, our map makes a powerful visual statement that is sure to start conversations. AVAILABLE IN 3 SIZES: 3 Panels x 20x30 inches = 60x30 inches total (153x76 cm) 3 Panels x 24x36 inches = 72x36 inches total (180x90 cm) 3 Panels x 27x40 inches = 80x40 inches total (200x100 cm) QUALITY MATERIALS & PROFESSIONALLY CONSTRUCTED: The canvas is museum quality poly cotton canvas (380gsm) with satin varnish and an UV-protective coating. 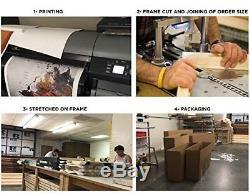 Each piece is hand assembled and framed in the USA by professional craftsman. 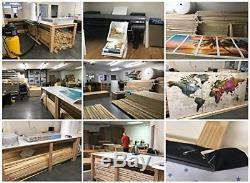 STRETCHED, FRAMED & READY TO HANG OUT OF THE BOX - We make it easy. Each of the 5 panel canvas prints are professionally gallery stretched on a 3cm wooden frame with the main image continuing around the sides staple free. They are ready to hang out of the box! PROFESSIONALLY PRINTED WITH HIGH-QUALITY INKS- High resolution printing using a Canon iPF8400 inkjet printer provides the highest print quality and reliably captures the most vibrant colors using inks which will last a life time. Mention details and specifications that you believe are relevant to your buyers. 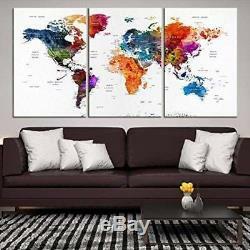 The item "Modern Abstract Best Seller Mixcolor World Map Push Pin Travel Map Wall Art for" is in sale since Thursday, November 22, 2018. This item is in the category "Home & Garden\Home Décor\Posters & Prints".tzvishai3" and is located in US. This item can be shipped to United States, Canada, United Kingdom, China, Mexico, Germany, Japan, Brazil, France, Australia, Denmark, Romania, Slovakia, Bulgaria, Czech republic, Finland, Hungary, Latvia, Lithuania, Malta, Estonia, Greece, Portugal, Cyprus, Slovenia, Sweden, South Korea, Indonesia, Taiwan, South africa, Thailand, Belgium, Hong Kong, Ireland, Netherlands, Poland, Spain, Italy, Austria, Bahamas, New Zealand, Philippines, Singapore, Switzerland, Norway, Ukraine, Croatia, Malaysia, Colombia, Costa rica, Panama, Trinidad and tobago, Guatemala, Honduras, Jamaica, Viet nam.